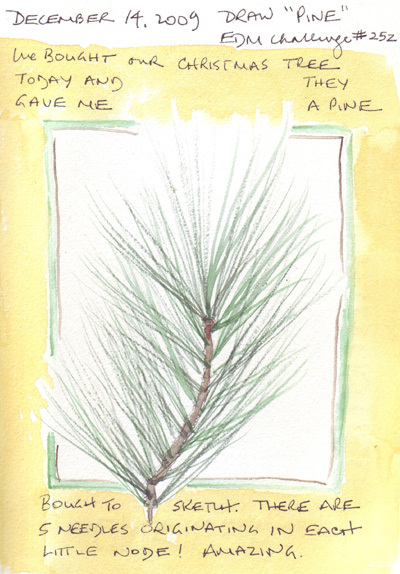 On Monday we bought our Christmas Tree and I picked up a pine bough for EDM Challenge #252. I was able to really study the way that the needles grew from the branch, and on this one there were 5 long needles from each little knob along the it. Fascinating!! 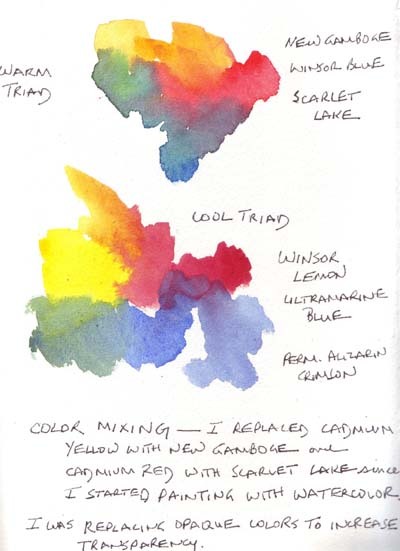 I used my rigger brush and both tube watercolors and paint removed from the tip of my watercolor pencil. Two of my grandchildren have birthdays this week, making the holiday schedule even more complicated. Long time readers of this blog may remember our frantic dash to London when Callum arrived 6 weeks early - and one day before Sydney's 2nd birthday. 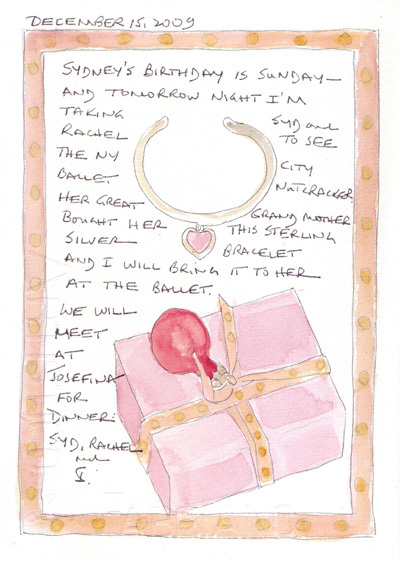 Tonight I'm taking my daughter, and Sydney to their first NY City Ballet production of The Nutcracker for her birthday. My mother, Sydney's great grandmother, gave me a a small silver bracelet to give to her to wear to Lincoln Center. We are very excited! 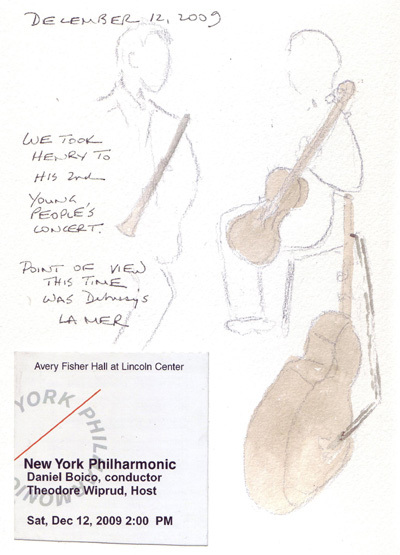 Saturday we took our 6 year old grandson, Henry, to his second NY Philharmonic Young People's Concert. 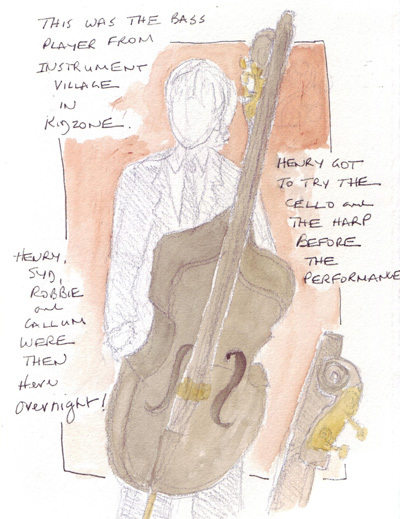 At Kidzone, an hour before the concert, he was able to try playing a cello and a harp, compose a bar of music which was then played by a violinist, and watch Instrument Village play compositions by young composers. 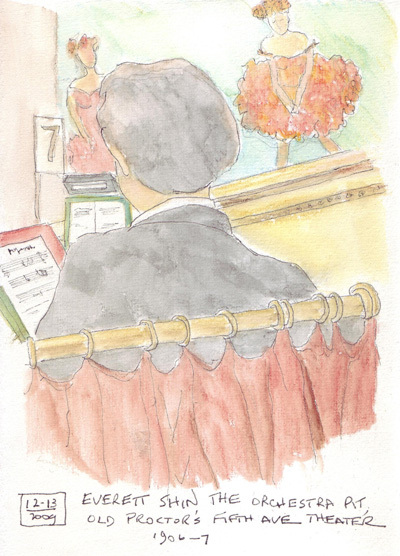 While he listened to them for 10-15 minutes, I sketched a few of the musicians. 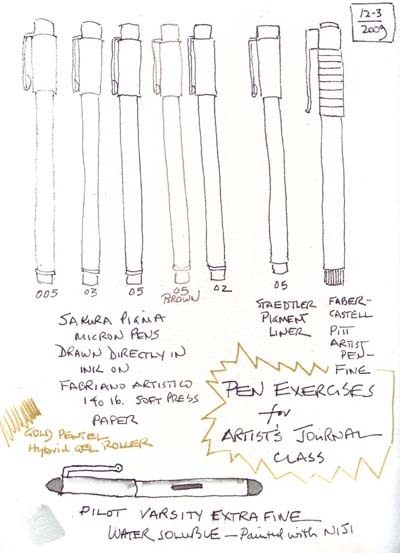 On Sunday morning, the Meet-Up Central Park Drawing Group met at the Metropolitan Museum of Art to sketch. 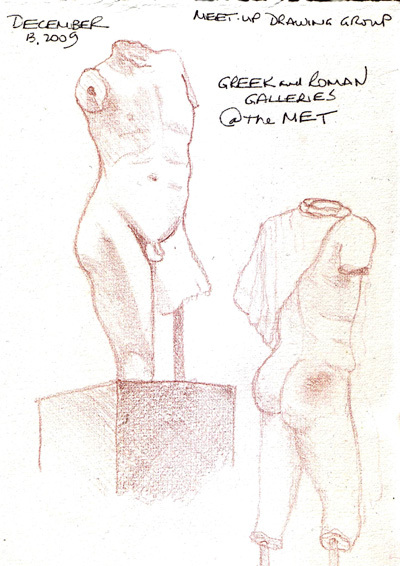 We started in the Greek and Roman Galleries with two 30 minute sketch sessions. 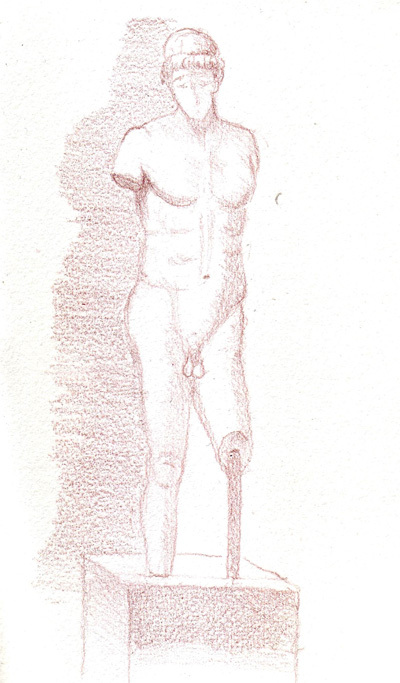 I drew 3 statues with watercolor pencil, and may still add water. 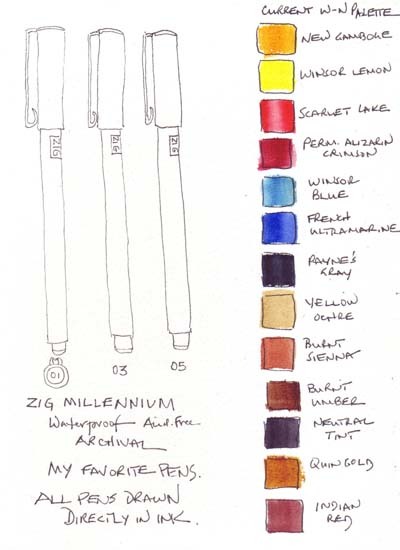 We then moved to the American painting exhibit - and I sketched a painting by Everett Shin, using watercolor pencils to add color. Only pencils and pens are permitted in the Museum, so I surreptitiously added water with a Niji waterbrush, to paint it as we left the gallery. 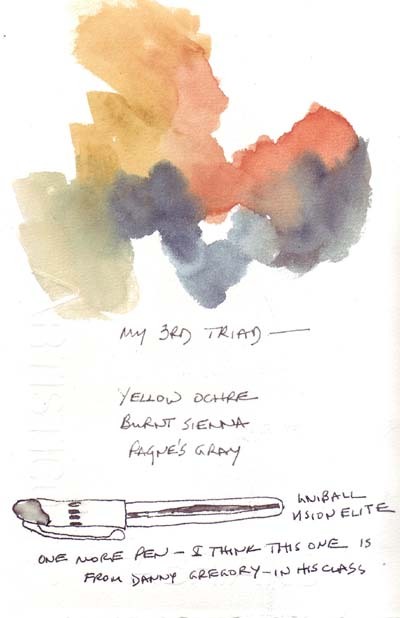 In Kate's "Artist's Journal class" we are exploring various media that we own or have never used and this week I sketched my whole repetoire of pens and the 3 watercolor triads that I use for mixing colors. 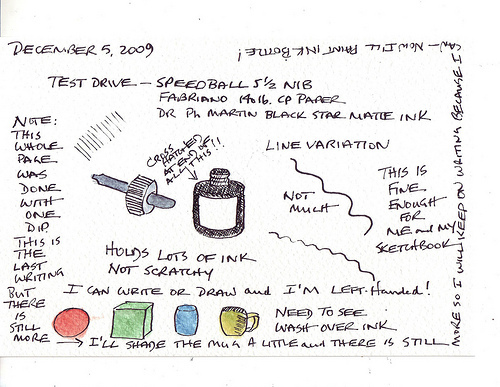 After documenting what I had, I decided to make a trip to NY Central Art Supply today to learn about nibs for dip pens and to bring some home to try. Here are two EDM Challenges from several weeks ago. 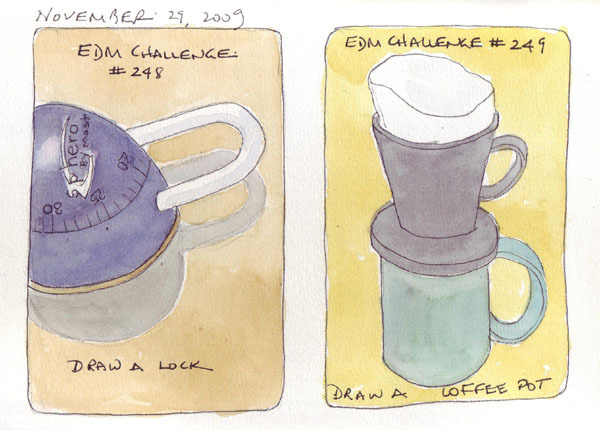 One of my art goals for 2009 was to draw the EDM Challenges weekly, but I'm not as diligent as I was in years past. I never did several of them, and seem to be late posting them more frequently. Here is my husband's lock for his gym locker and I think the only "coffee pot" among many in our apartment that I haven't drawn and painted previously. This is a one mug Melitta coffee filter - which makes an acceptable cup of filtered French Roast coffee. 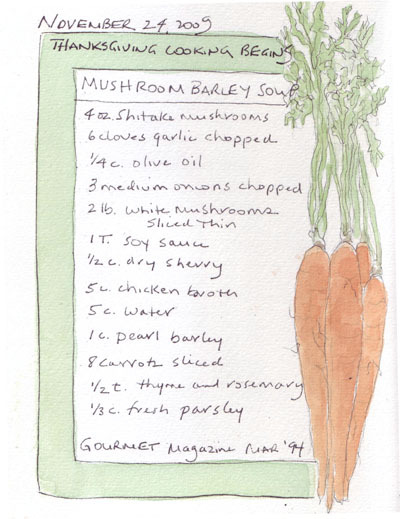 Tuesday: I bought great carrots to use for our soup and decided to sketch them while cooking. 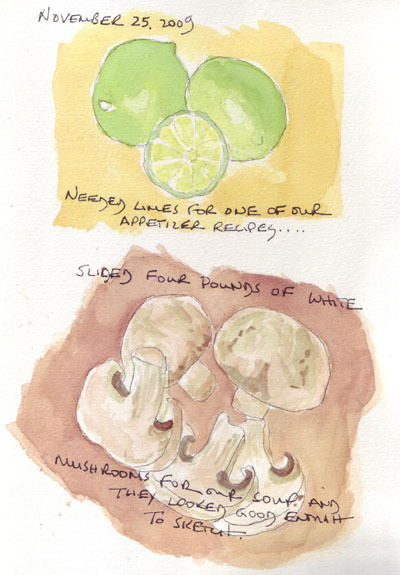 Wednesday: I used fresh lime juice for a recipe and cut up all of the mushrooms for soup - and sketched and painted both of these while taking a break from cooking. Thursday: The day was a whirlwind, and after the guests left and the children were asleep, I sketched and painted my 2 year old grandson's stuffed flamingo. He loves flamingos and entertains us constantly by assuming a one-legged flamingo pose and flapping his wings. When my daughter came in the morning to pick us up with all of the food, he was hugging the flamingo and shared it briefly with me. I would like to make this into a Christmas ornament this year for his stocking so none of us will forget this great stage.